COMO, Italy--(BUSINESS WIRE)--Starwood Hotels & Resorts Worldwide, Inc., in agreement with Grand Hotel di Como Srl, today announced the opening of Sheraton® Lake Como Hotel, a strategic conversion located in Italy’s world famous lake region. Surrounded by the majestic beauty of the Alps and the bright blue water of Lake Como, the hotel offers guests a visually captivating experience. Renovated by the renowned Italian architect, Ruggero Venelli, the property incorporates top-quality, natural materials and a neutral palette to produce warm interior spaces, and as a nod to local talent, the hotel features custom handcrafted furniture from acclaimed Italian designers. 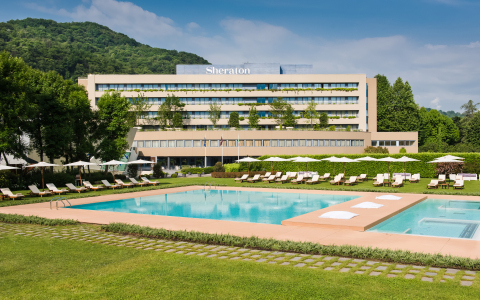 Sheraton Lake Como offers 116 guestrooms, including four newly renovated suites, and a range of leisure facilities, from a Sheraton® Fitness Center to two outdoor swimming pools with a Jacuzzi. The property also features a private park for sunbathing, jogging, and picnicking. An ideal choice for meetings and functions, Sheraton Lake Como features a large conference center with 10 modular rooms. Each room can hold between 40-150 people, and together, the 10 rooms can accommodate up to 1,000 guests. Spazio Como, a futuristically designed multi-functional space by famed Italian architect Attilio Terragni, can host up to 350 people. The property is also conveniently adjacent to the area’s prestigious Villa Erba Exhibition and Conference Centre. Sheraton Lake Como is located in northern Italy, within close proximity to Como’s historical center, which boasts notable churches, flourishing gardens, museums, elegant villas, and fine dining. The hotel is also a short walking distance from the Lake Como shore, where guests can partake in a variety of water-based activities or take advantage of the accessible launches for boat trips around the lake for an additional fee. Two distinctive dining venues provide an array of culinary options—from a modern twist to Italy’s renowned cuisine at Gusto Restaurant to the flavors of South America at Kincho Restaurant—in addition to the Lobby Bar and Sheraton Club lounge. The property is less than an hour’s drive from two key international airports, the Milan Malpensa and the Milan Linate. Alternatively, visitors can travel by train to the Como San Giovanni station, only two kilometers from the hotel. Private taxi service is available outside the stop. Starwood currently has 24 hotels in Italy, representing five of its lifestyle brands: St. Regis, The Luxury Collection, Sheraton, Westin and Four Points by Sheraton. This includes eight Sheraton hotels in bustling destinations such as Milan, Rome and Porto Cervo. Sheraton Hotels & Resorts is on a mission to bring people together through communal experiences because we believe that travel is better when shared. As the largest and most global brand of Starwood Hotels & Resorts Worldwide, Inc., Sheraton helps guests make connections at more than 430 hotels in more than 70 countries around the world through signature offerings such as the exclusive Sheraton Club lounge and Paired, our new menu of expertly matched small plates, premium wines and craft beers. The brand recently launched Sheraton 2020, a comprehensive 10 point plan designed to make Sheraton the global hotel brand of choice, everywhere. Sheraton, like all brands within the Starwood portfolio, is proud to offer the Starwood Preferred Guest® program, the industry’s leading loyalty program. To learn more, visit www.sheraton.com. Stay connected to Sheraton: @sheratonhotels on Twitter and Instagram and facebook.com/Sheraton. Grand Hotel di Como Srl, owner of the recently converted Sheraton Lake Como is a fully integrated hotel company, part of Meta Spa, the group holding owned by the De Santis family. With over 200 employees, Meta is one of the leading hospitality companies in Lake Como region. Como, Italy, June 9, 2015—Starwood Hotels & Resorts Worldwide, Inc. in agreement with Grand Hotel di Como Srl today announced the opening of Sheraton® Lake Como Hotel.